Construction and Housing Minister presents 'Arrow to the Negev' plan to facilitate Jewish development in south. 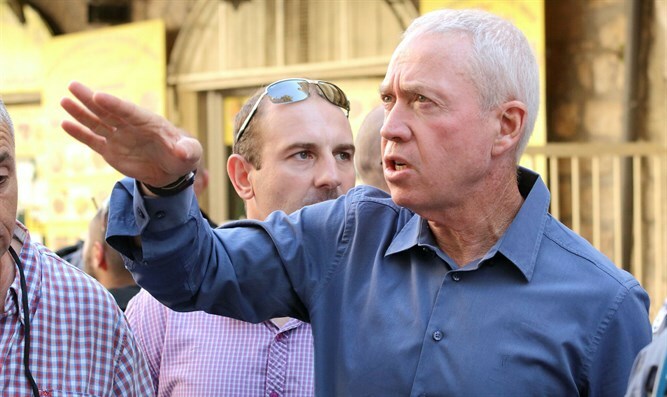 Construction and Housing Minister Yoav Galant presented Monday the "Arrow to the South" plan to strengthen the Jewish presence in the Negev and prevent the loss of Israeli control over the area. Galant stated that the plan is a response to a range of issues, from the expansion of the Palestinian Authority from the Hevron area and its environs towards the Negev, to the increasing agricultural terrorism, to illegal construction and to the other severe phenomena that have affected the Negev. According to Galant, "the south is under attack, and not only from Gaza. The illegal occupation of the Bedouin is eroding Zionist sovereignty in the Negev, and the Negev is in danger and there is a real fear of hostile takeover. I consider myself a duty and a right to lead the issue of Jewish settlement in the Negev, and the establishment of new settlements is the lifeblood of Zionism. " The plan presented by Galant includes the establishment of new settlements in the area, in a geographical structure that creates territorial contiguity that provides protection to the residents of the Negev, thereby creating a barrier and protection against a Bedouin takeover and an Islamist movement from the southern Hevron hills to the Negev. Galant added that the illegal construction in the Negev leads to other illegal activities that disrupt daily life, from the extortion of protection fees to the continuation of agricultural terror, and leaves entire areas open to Islamist expansion in Israel. "Today, we have the duty to establish a long vision for our continued hold on the region and to define a plan for solving the problem, which stems primarily from strengthening Jewish settlement in the Negev." 1. "Rout 25 Axis" - establishing four new towns on Route 25 in the Negev, which connects Be'er Sheva to Dimona. This is a revolutionary plan for the establishment of rural towns in the area, which include about 250 housing units in each of the towns, and a total of about 1,000 housing units. 2. The Five Points Plan in the Negev - Final approval of the plan for the establishment of 5 communities in the Negev, which was submitted for debate 18 months ago, and details the establishment of five settlements that add a total of 5,200 housing units. 3. Ir Ovot - The establishment of the community of Ir Ovot in the Arava, with about 250 housing units. 4. Hanun - The establishment of the community of Hanun in the Gaza perimeter area is intended for about 400 families in the area of ​​the regional council of Shoret Negev, east of Kibbutz Sa'ad. 5. "Mevo'ot Arad" - "Mevo'ot Arad", which includes the establishment of five new rural settlements in the Negev, 250 housing units each, and a total of 1,250 housing units. Hiran: A town under construction that will be built on one of the extensions of Mount Hiran, located on the route between Meitar and Arad, in the northeastern Negev. The new town will house some 2,400 families and about 10,000 residents. 7. Envelopment of existing communities through the Ministry of Construction and Housing's plan to encourage rural settlement in the Negev - an incentive for absorption through grants for the treatment of old infrastructures and public buildings. The seven components constitute a series of actions that allow, first and foremost, the creation of territorial contiguity to protect and strengthen the security of the State of Israel, while preventing the loss of the Negev, which constitutes a strategic point, both security and Zionist, for the State of Israel.